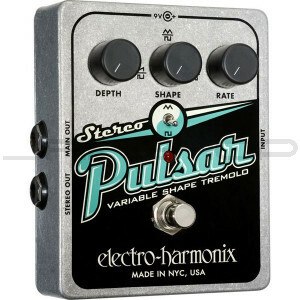 The Electro-Harmonix Micro Stereo Pulsar Tremolo Effects Pedal is everything you love about the Pulsar in a small, die-cast aluminum package. Controls: Wave shape switch selects between the wave triangle mode and the square wave mode. Shape knob changes the shape of the waveform that modulates the tremolo. Wave triangle mode as the shape knob is turned from the counter clockwise (minimum) position to the center (middle) position, the wave starts as a rising sawtooth and becomes a triangle. From the center position to the clockwise (maximum) position, the wave changes from a triangle to a falling sawtooth. Square wave mode as the shape knob is turned from the counter clockwise (minimum) position to the center (middle) position, the wave starts as a small pulse width wave and becomes a square width wave. From the center position to the clockwise (maximum) position, the wave changes from a square width wave to a large pulse width wave.